NEW YORK (CNS) — Nancy is cool again. While many may only dimly remember her as a mid-20th century comic-strip character, the girl with the dot eyes, Brillo hair and a sidekick named Sluggo has been rediscovered by her genre’s current elite. Respected cartoonists like Daniel Clowes (“Eightball”) and Bill Griffith (“Zippy”) have celebrated “Nancy” — a simply drawn strip with broad jokes — as a work of timeless, Zen-like art. The first two Fantagraphics collections, “Nancy is Happy: Complete Dailies 1943-1945” and “Nancy Likes Christmas: Complete Dailies 1946-1948,” were published in 2012. 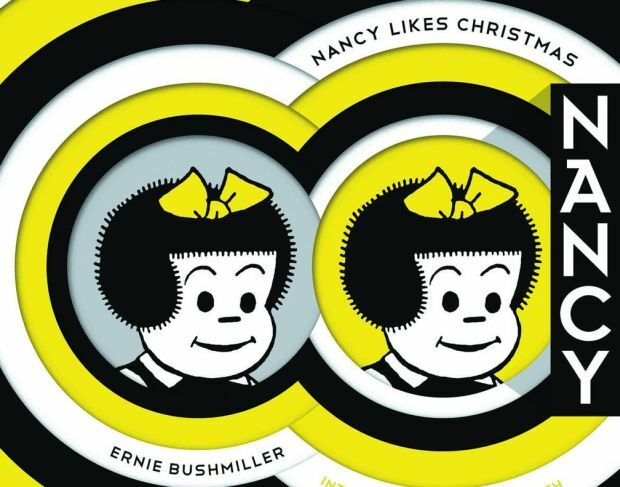 The third volume, “Nancy Loves Sluggo: Complete Dailies 1949-1951,” came out in December. These are charming, ageless strips, lovingly reproduced in black and white and suitable for all ages. Indeed, young children just learning to read would likely find “Nancy” a delightful aid to their efforts. A lot of the humor in “Nancy” is corny, which is what made the strip seem so square when pensive superheroes and underground hippie comics came to the fore in the 1960s. Yet, while those once cutting-edge innovations now seem as dated as dancing the frug, “Nancy” still comes across as fresh. The comic successfully taps into universal joke archetypes that transcend not only time but language, which explains why it has remained syndicated — and popular — throughout the world. One fan called Bushmiller an architect more than a cartoonist. He uses everything in his strip to support the joke — providing the reader with nothing more, but nothing less. Spare as it is, there’s something mesmerizing about Bushmiller’s art. Like “Peanuts,” “Nancy” skillfully represents life as seen from a child’s view. It uses the minimal essentials to achieve a kind of Platonic perfection. Judge reviews comic books and video games for Catholic News Service.